This chapter outlines the theoretical and methodological tools that serve as a foundation for this book. In order to understand the claims and counterclaims contained in the different chapters of this book, I present here a necessary theoretical synopsis for the readers. 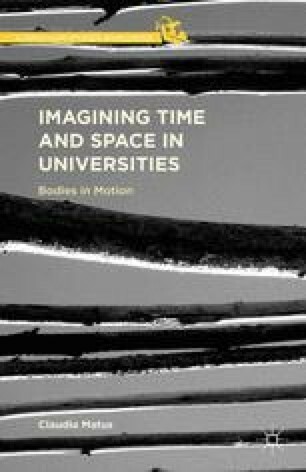 Imagining Time and Space in Universities: Bodies in Motion presents critical theorizations of time and space, which question the access we have to different experiences of international movement. These theorizations reveal the inherently unstable nature of dominant discourses regarding trajectories and traveling. I argue that internationalization discourses produce certain institutional subjectivities and practices due to their implicit ideas about time and space embedded on their dominant definitions. These dimensions have been understood in separate and hierarchical modes, which mean that producing accounts of meaningful experiences with institutional progress necessitates the advancement of an understanding that sees space as a key element of the showing up of the world1 (Massey, 2005) and time as the succession of predictable pasts, presents, and futures (Grosz, 1999). For instance, the common idea that tells us that academics or graduate international students who move from one place to another carry specific attributes and characteristics of their geography with them makes us hold on to the idea that there is a strict correspondence between place and identity (e.g., Peruvians act as Peruvians because they come from Peru).